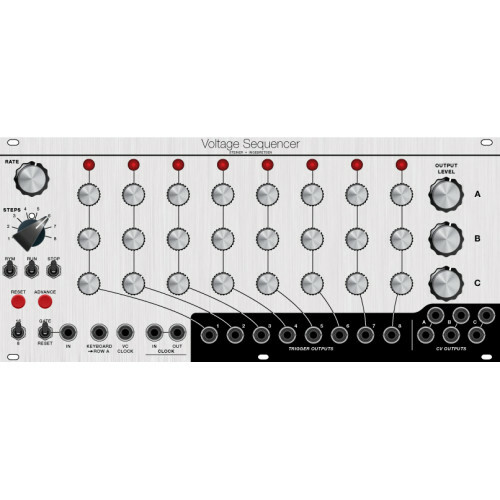 A 4:4 cycling sequential switch, featuring simultaneous forward/reverse stepping, hold, reset, and an additional voltage controlled mode based on the same design as our VC Sequencer. 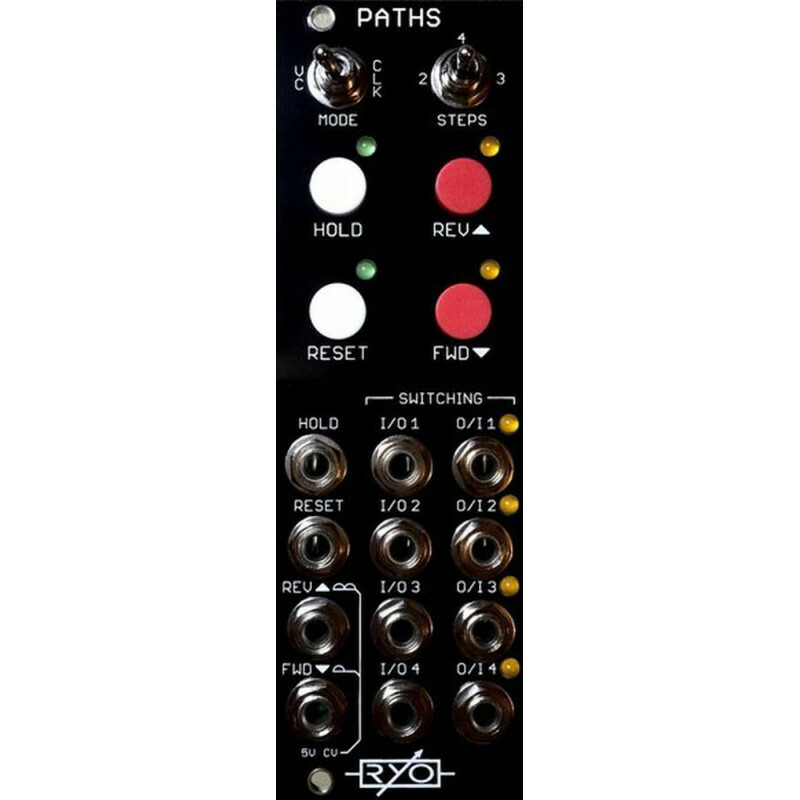 Also on board are push buttons for each function enabling you to play and perform the switching with a more human input. This sequential switch will do all your standard 1>2, 1>3, 1>4 or the other way around with great real-time as well as external voltage controllability. But its when you start playing around with multiple sources and destinations that things start getting fun and weird! You could for instance shuffle around four different trigger patterns to trigger four different percussive generators for interesting variations, or why not 4 oscillators shuffling between 4 different destinations, panned and processed in various ways? 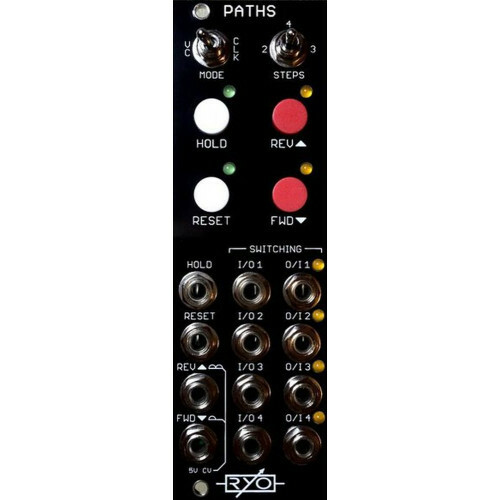 Whatever your sequential switch application might be, we're confident the Paths is up to the task! 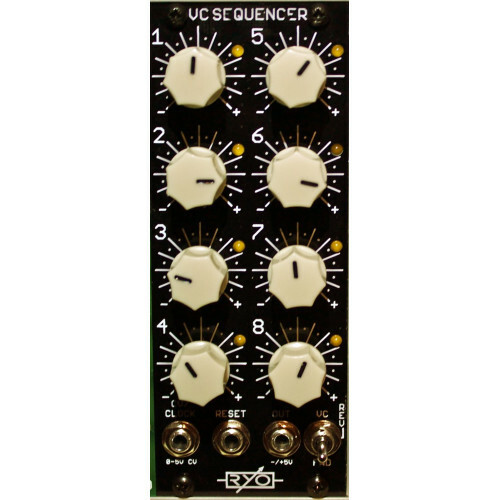 Just like the VC Sequencer it is clockable by very high clock rates (100 kHz tested) and CVable with full audio range. All for your experimental waveshaping duties. When clocking with FWD clock input or button the sequence will advance one step forward. When clocking with REV clock input or button the sequence will advance one step in reverse. If a clock comes in exactly at the same time on both inputs the forward will have priority over the reverse. In CV mode there is two CV inputs. The one that shares the reverse clock input is full wave rectified and the one that shares the forward clock input is half wave rectified. It uses an active rectifier without voltage drop or a dead zone around 0V. The CV inputs are mixed together so they can be used at the same time. The steps toggle switch and the red buttons are inactive in CV mode. To limit the number of steps in CV mode you can use an attenuator to attenuate the CV down to only reach 2 or 3 steps. It's essentially four separate switches that is commonly controlled and shares ins and outs. 2/4/3 Steps and reverse direction. The toggle switch that controls number of steps works a little pequliar due to the CMOS CD4516 counter IC. Reset always takes it back to step 1/first LED lit. We could then choose to always let it reset on step 3 and 4 respectively for 2 and 3 steps.